At 65, Mohammad Abed Ali leads too busy a life to find time for his family. The small-time farmer from Haridevpur village in Bangladesh’s Rangpur district is least bothered about the long predicted impacts of climate change on the country. Bangladesh has been categorised as the most vulnerable country to climate change. And farmers like Abed are expected to face erratic weather conditions impacting their livelihood. He should also be worried as he falls in the official category of extreme poor and his village is notorious for having famine-like situation, locally called monga, every year. But Abed smiles away the threat of climate change. Four crops a year, he says, is the reason for his hectic life. From morning, he has been scavenging a part of his half-a-hectare farm to harvest potato. Taking a break towards noon, he attends his small patch of tobacco crop. “I have to monitor the sale of the winter paddy harvest,” he murmurs, when asked to stop for photographs. At Haridevpur, everybody is talking about a booming economy, and a new crop season in between the staple summer and winter crops that holds the key to combat monga. 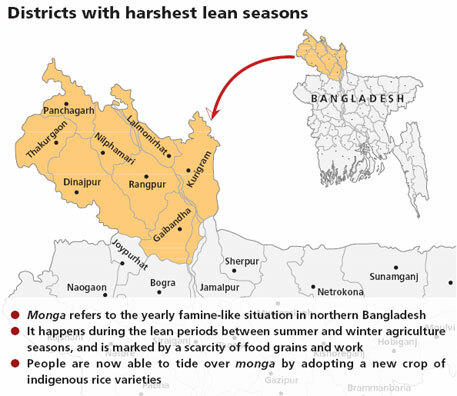 But not long ago, it was a different story in northern Bangladesh, which is hit by monga twice every year—mid-September to mid-November and mid-March to April. Monga is a lean period between agriculture seasons which sees a scarcity of food grains and work that result in a famine-like situation. Since independence, Bangladesh has been fighting hard to fix this condition. During the monga periods, people, particularly the poor small farmers and the large number of farm labourers, face starvation. In northern Bangladesh almost all farmers cultivate aman (summer) rice crop, where they grow a long duration rice variety that requires 146-160 days to harvest. Farmers prepare the seedbed and sow the seeds in late June and finish the sowing cycle by early September. After that there is little farming work required from late September to early November in the rice fields, which results in monga. 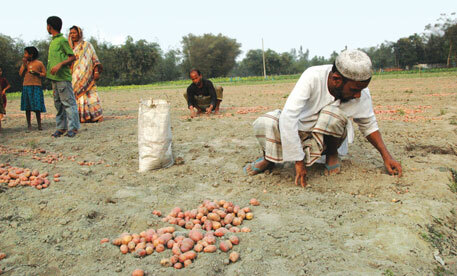 Around 70 per cent of the labourers and landless poor wholly depend on the summer crop for employment. During the lean period there is hardly any work for them. With limited food stock in the area and no income, it is normal for the people in northern Bangladesh to have irregular meals. This is also the reason people of northern Bangladesh suffer more food insecurity than the rest of the country. Add to this late floods in the area which destroy the monsoon rice. Scientists say the floods are an impact of climate change. In the last two decades, the Rangpur region has witnessed six major floods during late August and mid-September, which is the peak time for summer rice crop. 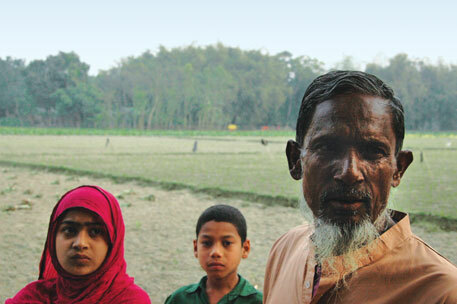 Farmer Sahinoor Alam’s face gathers wrinkles as he narrates his past. “Just a decade ago, during monga we would enter the forest to survive on roots and tubers. If lucky, my family would have one meal every second day.” The village, like others in the region, used to be deserted as people moved out for survival. Most small farmers and farm labourers would commit to sell their grains and labour in advance for the next farming season at throwaway price in exchange for some money during the monga periods. “This set a vicious cycle of debt. Even in a year of good harvest, people will not have the benefits as they would have sold out in advance,” says Mamunur Rashid, an agriculture specialist working with non-profit RSDS Bangladesh. Abed remembers how his family had to sell 40 ha of land to fight successive debt because of monga. “Each famine season, we will mortgage a part of the vast land, which could never be freed,” he says. The change came about after RSDS started an extensive programme in Haridevpur to fight the seasonal monga. At the core of the programme is a new crop cycle during the lean period. Farmers in the north now cultivate rice thrice a year in about 0.5 million hectares (ha). Traditionally, farmers plant boro rice (winter crop) seedlings in December to January and harvest in late April to early May. Farmers generally transplant aman rice seedlings in the same land in late July to early August, and harvest in late November to early December. The land is left fallow for more than two months in between boro and aman seasons. RSDS identified this period to introduce a short duration crop season to tide over monga. This helps in two ways: first it addresses the issue of food scarcity and increases the income of farmers. Second, agricultural labourers get employment. As a result, farmers in northern Bangladesh today grow four more crops: a short-duration paddy crop in between the two staples, jute, potato and tobacco. This posed a challenge: getting suitable rice varieties that can be sown and harvested within this short period. Since 2003, RSDS has been experimenting with extinct indigenous rice varieties in their lab farms. It started with 11 extinct varieties such as shaita, pariza and shurjamukhi. Based on this research, they found pariza as the most suitable variety because of its short cultivation time and high yield. The short duration of cultivation means pariza plantation is ready for harvest before the floods. The variety requires 90 days from sowing to harvest, which can be reduced to 70 days if 20-days-old seedlings are transplanted. Its yield of three tonnes per hectare is also encouraging given the low cost of production. RSDS has been conducting Farmer Field School under which farmers gather every month and discuss new agricultural technology and test them on demonstration plots to check their viability. This village-level institution was used to encourage people to introduce the new short duration rice. Before introducing pariza, the RSDS also initiated development of other short-duration varieties. In 2003, RSDS, along with irrigation and water management division of the Bangladesh Agricultural Research Institute, piloted the BRRI dhan33 in field as a short-duration rice variety to mitigate monga. In 2004, through a research programme, RSDS found that the short-duration variety was economical and suitable to the distress period. In direct seedling condition, the yield was 4.1 tonnes per ha and it was possible to harvest within 100 days of seeding. Under transplanting condition, the yield was 3.8 tonnes per ha and was possible to harvest within 120 days of seeding. The success in Haridevpur has spread far. All the districts in the northern part of the country are fast adopting the new crop. In 2005, the first batch of 18 farmers took up the cultivation and got a yield of 4 tonnes per ha and crops were harvested in early October. In 2006, it boomed, with 1,900 farmers growing the new crop in 1,271 ha. Next year, 5,928 farmers took up the new crop in 1,820 ha. As the impact of monga reduced, the caretaker government in 2008 extended the new crop to 40,000 ha. The first impact of the turnaround is that farmers no more sell their produce in advance. Usually short-duration rice variety yields less in comparison to regular varieties, but due to the low cost of production and high price in the market, it turns out to be profitable. The other advantage is that the winter crop starts immediately after the harvest of the short-term crops, which leaves no space for unemployment or leaving the field fallow. This means there is less fallow land and more work to be done. “The small farmers now have some bargaining power with traders as they are certain about the yield,” says Rashid. Under the new crop mix, the third crop absorbs around 60 labour days/ha for harvest and post-harvest operations in lean period, where none was available. Due to the introduction of the short-duration crop variety, migration for jobs by agricultural labourers outside their home area has reduced significantly. According to an impact assessment by Abul Khair and Maniruzzaman Sikder of Jahangirnagar University, if 0.6 million ha of land in Rangpur division is brought under the pariza rice cultivation technology, it will create additional 40 million working days or two million labourers will get 15 to 20 days of job. 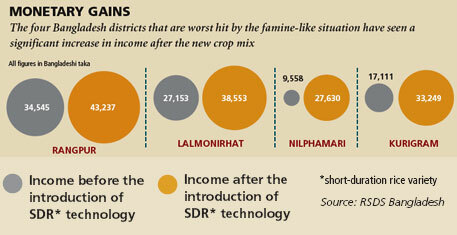 On the other hand, according to M G Neogi, an agriculture scientist who has studied the experiment extensively, if the new mix is adopted across the country, it will yield nine million tonnes of additional rice on 3.5 million ha. This is more than the country’s current rice grain deficit. Small wonder that politicians now talk about the success of this new crop mix. Monga for long has been a political agenda and political parties are now banking on the new crop mix. Bangladesh prime minister’s son, Sajeeb Wazed, is relying on it for political success. During political rallies, he tells the people that monga will return if his party is voted out of power. This is for the first time that a solution to monga is turning into a best political case for exploitation. “Whatever it is. We are happy, there is no monga,” says Abed. This is the success made anew. Such system were in vogue in Indian Subcontinent and farmers were more or less happy with their produce as it gave an opportunity to use variety of crops.Aggressive Green Revolution in the name of development and science has the overall fabric of Indian agriculture by bringing in the business of costly hazardous external chemicals and seeds. Meanwhile the farmers have last their traditional knowledge of agriculture, totally depended on agro input dealers. Lovely story of a genuine agricultural innovation to address a real and widespread problem... peoples enthusiastic adoption of this method shows it relevance and soundness. Reminds me in some ways of the No Pesticide Management approach widespreading real fast in Andhra Pradesh in India thanks to Centre for Sustainable Agriculture and a open active state government... to a few million farmers now ! This is what agricultural innovation, development and research is about... not a lot of the nonsense that goes in its name..